With all the hype around bringing in Roy Halladay, Cliff Lee, and Roy Oswalt it has been the home-grown Cole Hamels that has been the most impressive this season. Hamels is 9-2 with a 2.49 ERA and a 0.92 WHIP. If I had to make the decision, Hamels would be the starter for the National League in the All Star Game. Even with all the wins over the past week, the Red Sox have been stung by the injury bug this week losing Jed Lowrie, Carl Crawford, and Clay Buchholz to the 15 day disabled list. Marco Scutaro is hitting over .400 in Lowrie’s absence. JD Drew has had a knack for getting hot in June in years past when someone has gone on the DL. With Crawford out, there is no better time than now for JD to get hot. Derek Jeter landed on the disabled list being just 6 hits shy of 3,000. Even as a Red Sox fan I will most definitely be cheering him on when he gets that coveted hit. I have long said the steroid scandal of the late nineties and early 2000’s wouldn’t bother me unless Jeter or Griffey were named as users. Jeter is clearly on the back nine of his career, and I think people should start to recognize how awesome he was during the course of his career. The Brewers are finally showing the potential that I had seen in them in the preseason when I predicted they would win the NL Central. They already have an awesome offense and now their pitching staff has rounded into shape with Yovanni Gallardo, Shaun Marcum, and Zack Grienke. John Axford is 19-21 in save opportunities as well. The Brewers have close to zero weaknesses. The Indians fired hitting coach Jon Nunnally on Sunday. The Indians are in first place by one game and their offense has been underperforming. Shin Soo Choo and Carlos Santana have been especially disappointing but help is on the way as Travis Hafner is off the disabled list. Players aren’t happy with the Nunnally firing saying they don’t understand why he is fired when the team surprised everyone to this point by being in first place. I side with the players here. The Giants have lost four in a row (three to the lowly A’s) and are now only a half game up on the Diamondbacks in the NL West. The Giants are the only first place team with a negative run differential in all of baseball. With Buster Posey and Freddy Sanchez out, Pablo Sandoval has very little protection in the order. The Giants will not be in first place for very long. Earlier in the season I remember bashing Justin Upton and the Diamondbacks front office because GM Kevin Towers said that if the Red Sox wanted Upton they would have to give up Jacoby Ellsbury, Clay Buchholz, and Daniel Bard. (I wrote this in my Week 3 rankings). I would not move any of those guys 1 for 1 for Upton let alone all three. But an update on Upton: He is hitting .302 with 12 home runs and 38 runs batted in with 13 steals. Jason Heyward came back from the disabled list this week and it looked as if the Braves were starting to get healthy again. But to say that Heyward is in a sophomore slump would be putting it mildly. He is hitting just .215 with 17 runs batted in through 50 games. At least he has 7 home runs. The Braves desperately need to get him going. The Cardinals are in a bit of a funk for the first time this season after getting swept by the Nationals. They have lost their vice grip on first place as the Brewers have leaped frogged over them. Of the 72 games they have played this season, the Birds have gotten only 36 quality starts. Jaime Garcia and Kyle Lohse account for 17 of those. James Shields now has 5 complete games this season and we are still 3 weeks away from the All Star Break. Last year Roy Halladay led the majors in that category with 9. The next closest pitcher was Adam Wainwright with 5. Shields truly has been remarkable this first half of the season and is deserving of a spot on the All Star team. All year I have been on the Tigers because I felt Miguel Cabrera was shouldering the offense on his own. Well Victor Martinez is hitting .329, Alex Avila is hitting .305 with 41 runs batted in, Jhonny Peralta is hitting .303 with 11 home runs and 43 runs batted in, and Brennan Boesch is at .295 with 10 home runs and 38 runs batted in. Finally it looks like Miggy has support in the batting order! After starting the season 7-0, Alexi Ogando has fallen on hard times in his last two starts getting absolutely rocked. Earlier in the week he lasted 1.2 innings giving up 6 runs on 6 hits in a losing effort against the Yankees. Today against the Braves he lasted just 5 innings in a losing effort. Are the wheels coming off already for the 27-year-old converted reliever? Last season MVP Joey Votto hit 37 home runs. To this point in the season he has just 9. He is still hitting .327 and has 43 runs batted in but the lack of power has to be a concern for the Reds. If he can find the home run stroke again, he and Jay Bruce (17 home runs so far this year) would be a mini murderer’s row. The Blue Jays announced that they have re-signed shortstop Yunel Escobar to a 2 year $10 million deal with club options for 2014 and 2015. Escobar has been consistent for the Blue Jays so far this season hitting .281 with 8 home runs, 26 runs batted in, and 42 runs scored. Bill Simmons tweeted it best yesterday when he pleaded with the Mariners GM to make a trade for some offense. Their top 3 pitchers are pitching lights out (Hernandez, Pineda, and Bedard), they have called up their top prospect who is also a top prospect in all of baseball (Dustin Ackley), and Ackley has already homered in just his second big league game. They are just 1.5 games out of first place and should definitely be buyers at the deadline. Last week I argued with myself about whether Paul Konerko deserves a plaque in Cooperstown. This week’s edition of “An Argument with Myself”? Does Todd Helton deserve a plaque in Cooperstown. 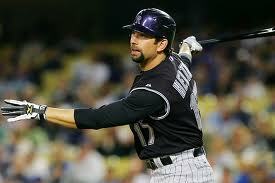 In 15 seasons, Helton has 2300 hits, 342 home runs, and 1269 runs batted in and is a lifetime .324 hitter. 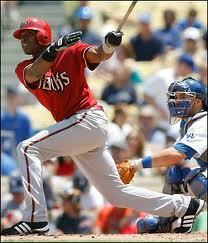 His best season was in 2000 when he led the league in batting average (.372) RBIS (147) and hits (216). He also led the league in on base percentage, slugging, total bases, and OPS. Helton would get my vote over Konerko even though Konerko has a ring. And yes, Helton is in. The Pirates continue to get solid starting pitching from Charlie Morton (7-3 3.21), Kevin Correia (8-6 3.60) and Jeff Karstens (4-4 2.54). With each week that passes, I become more and more surprised that the Pirates are still around the .500 mark. Going into Sunday the Nationals have won 8 games in a row which includes a sweep of one of the best team in baseball, the St. Louis Cardinals. Second baseman Danny Espinosa hit a walk off home run earlier this week. Espinosa is hitting .233 with 12 home runs and 41 runs batted in on the season. If he can work on that average, he has the potential to be one of the top second basemen in the game. While all the talk has been centered on Jose Reyes, I completely forgot that the Red Sox let Jason Bay walk as a free agent after the 2009 season only to have the Mets sign him to an $80 million deal over 5 years. Bay is currently hitting .222 with 2 home runs and 13 runs batted in. I don’t know if this is a curse of the Mets type of situation or “I’m sure glad the Red Sox didn’t resign that guy” type of situation. Speaking of busts. Adam Dunn signed a 4 year $56 million deal with the White Sox this offseason. Dunn has not been able to figure out American League pitching to this point however. Dunn is hitting .182 with 7 home runs and 29 runs batted in. 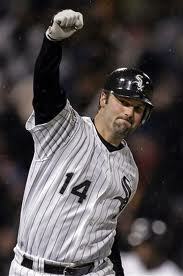 Paul Konerko has been just the opposite hitting .327 with 19 home runs and 56 runs batted in. Remember that Hall of Fame discussion? If Konerko can keep these numbers up he will be joining Helton. The Angels released Scott Kazmir this week eating $14 million in salary. Kazmir was getting rocked in the minors and it was evident that he was not going to factor into the Angels plans this season. I remember when Kazmir was a stud on the then Devil Rays. My how times have changed. What happened to Nick Markakis? I remember a time when I longed for him to patrol right field at Fenway Park. This year he is hitting just .256 with 5 home runs and 26 runs batted in. Markakis was once a player Orioles fans saw as the future of the franchise. It now looks like that future has come and gone and the Orioles still haven’t made up any ground in the American League East. With the Marlins in an absolute freefall losing 17 of their last 18, manager Edwin Gonzalez called the staff and team into a private meeting in the clubhouse letting them all know he was quitting. It wasn’t that long ago that the Marlins were a top 5 team in baseball this season. Count me as shocked that they have been as awful as they have been lately. He is the second manager to lose his job this year. 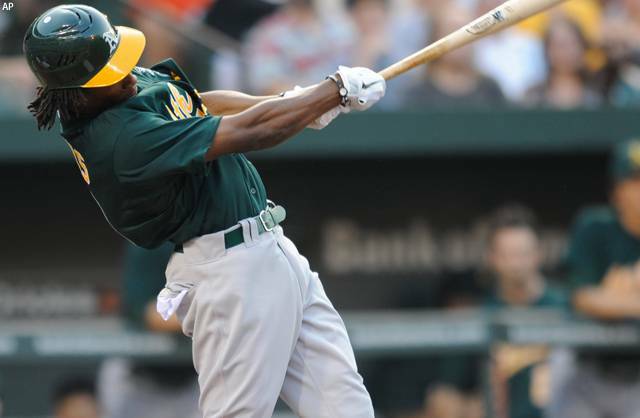 The Athletics called up Rickie’s little brother, Jemile Weeks late last week. I had been calling for this move for quite some time seeing that the Athletics have zero offensive fire power and are especially lacking from the infield positions. Through 11 games Weeks, is hitting .325 with 3 doubles, 3 triples, and 6 runs batted in. Since the AL West is wide open, the Athletics have a shot of getting back into the race. If they do, Weeks will be a large part as to why. While the Royals have some of the best young prospects in baseball, they are all offensive players. Hosmer, Moustakas, Butler, and Gordon will all help put runs on the board. But the problem with the Royals is the lack of pitching. Their best starter is Jeff Francis and his ERA is 4.83. The Twins are slowly starting their ascent up the rankings. After spending the first 2 months of the season teetering between the 29 and 30 spots, they are 8 games back of the Indians in the AL Central, have won 6 in a row, 8 of their last 10, and are 13-3 in June. 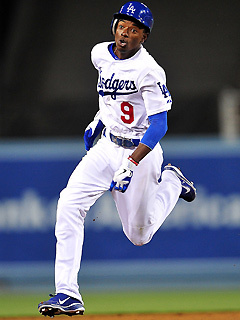 Dee Gordon was called up by the Dodgers earlier this week. He is the top prospect in the organization and is the son of ex-Red Sox Tom “Flash” Gordon. With how fast the young Gordon runs, it won’t be long before he will be called Flash as well. Through 11 games, Dee is hitting .326 with 4 stolen bases and a triple. Gordon has game changing speed that will add an element of excitement to the Dodgers, an organization that could use all the excitement it can get. Anthony Rizzo has been unable to bring his hot bat to the major league level. After tearing the cover off of the ball in the minors, Rizzo is hitting .148 through 9 games. But in his 4 hits, he has a single, double, triple, and a home run. The Cubs will clearly be sellers when the trade deadline comes around. The problem is Alfonso Soriano and Carlos Zambrano’s contracts are albatrosses and the Cubs are tied into them for at least 2 more years. The Cubs have the potential to be very bad for a very long period of time. As if they haven’t been like that already, seeing that they haven’t made it to the World Series since 1945. Hunter Pence is scheduled for an MRI on his hyperextended elbow Sunday. If the Astros lose him for any extended period of time, I am going to have to start ranking them with the Triple A teams.